The Traxxas Unlimited Desert Racer is a scale work of art with performance to match. However, RPM customers have reported the stock trailing arms are a weak link. If you’re tired of bending and breaking stock trailing arms, RPM has the answer! Our Trailing Arms are hands down some of the toughest and most innovative trailing arms available. What makes RPM versions so tough? We started by increasing the wall thicknesses by roughly 40% in the damage-prone areas around the shocks. We then added more material around the pivot balls by roughly 12%, using up all of the available room at the axle mount. 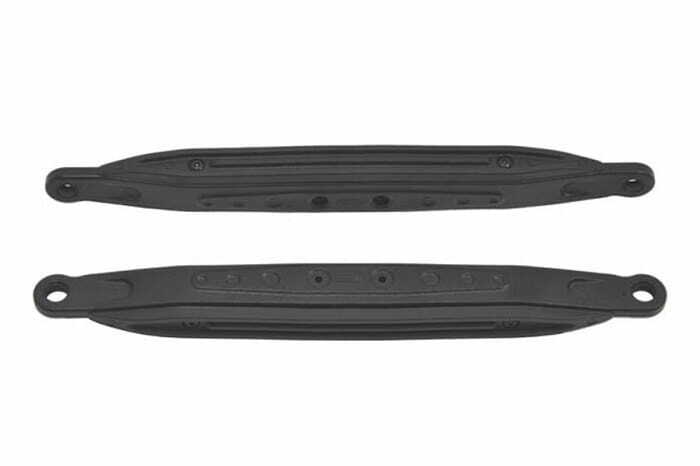 We also squared off the bottoms of our Trailing Arms, giving us room to build our unique, reversible Trailing Arm Skid Plates (RPM #81362 – sold separately). Adding RPM Trailing Arm Skid Plates to a set of our Trailing Arms will provide some of the best and toughest protection your ride deserves. RPM Trailing Arms are manufactured in the USA and are molded from our engineering grade nylons, factory backed with a limited lifetime breakage warranty. Bolt on a set today and never worry about fragile trailing arms again! Tech Notes: RPM Trailing Arms for the Traxxas Unlimited Desert Racer replace stock Traxxas #8544 and are sold in pairs. RPM #81362 Trailing Arm Skid Plates are sold separately.